Home > Post Office Savings > PPF- Public Provident Fund Account - No attachment under court decree order..! 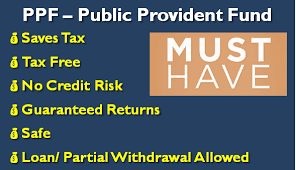 PPF- Public Provident Fund Account - No attachment under court decree order..! 1. From 1.4.2016, interest rates are as follows:- 8.10% per annum (compounded yearly). 2. Minimum Rs. 500. Maximum Rs. 1,50,000/- in a financial year. 3. Deposits can be made in lump-sum or in 12 installments. 5. Joint account cannot be opened. 6. Account can be opened by cash/cheque and In case of cheque, the date of realization of cheque in Govt. account shall be date of opening of account. 7. Nomination facility is available at the time of opening and also after opening of account. Account can be transferred from one post office to another. 8. The subscriber can open another account in the name of minors but subject to maximum investment limit by adding balance in all accounts. 9. Maturity period is 15 years but the same can be extended within one year of maturity for further 5 years and so on. 10. Maturity value can be retained without extension and without further deposits also. 11. Premature closure is not allowed before 5 years. After 5 years now completely withdraw with 1% penalty. 12. Deposits qualify for deduction from income under Section 80C of Indian IT Act. 13. Interest is completely tax-free. 14. Loan facility available from 3rd financial year. 15. No attachment under court decree order. 16. The PPF account can be opened in a Post Office which is Double handed and above. 17. The PPF account can be opened in banks like SBI, ICICI Bank..